Make sure you read the app Quick Start Guide before starting. If you don't have this application yet, download it here. The menu item app provides you with a SEBLOD-powered way of administering your site's menu items. Among other benefits, this means that you can manage menu items directly through the front end of your site. 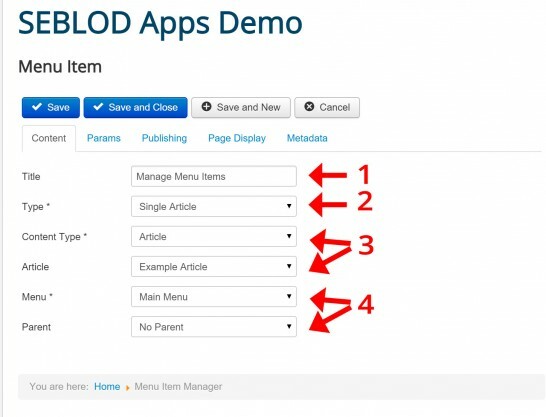 The menu item app currently lets you create 2 different types of menu items through SEBLOD: a link to a single article, or a link to a SEBLOD List & Search. Menu's themselves cannot be created through this app. Menu items can be managed through the front or back-end menu item manager. First, ensure that you have created your menu in the usual way using Joomla. You will then be able to assign menu items to this menu using the app. 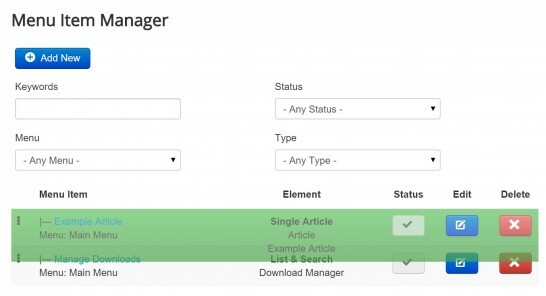 If you select the "Single Article" menu item type, you will then have options to select the Content Type and Article that you wish to link to. If you select "List & Search" type, you will then be able to select the List & Search type you want to link to. You then assign your menu item to one of your pre-existing Joomla! menus and select a menu item parent, if you need to establish hierarchy in your menu structure. The order of your menu items can be manipulated by clicking and dragging the icon of each menu item in to the order you require. After saving your new menu item, it will appear in the menu that you selected in step 4.
the integration process is not enabled on the Joomla! Menu Item manager.